The best-ever roast chicken has become such a staple I figured I should make the most of it and use the carcass to make stock. But it would have to be a stock that was easy to make and required few extra ingredients, for it to become a part of our weekly routine. I think I’ve found the answer. Food 52 (of course) has a chicken broth from scratch which they then use to make a simple chicken noodle soup in a French style. At its most basic, you simply use a head of garlic, two onions, a cup of wine and then water and a few sprigs of thyme. (Now that I’ve storing left-over thyme wrapped in a damp paper towel in a ziplock bag, I usually have some in the fridge and only buy it every few weeks). The original recipe uses red wine. Today, practically-housebound as we wait for “Frankenstorm” to hit, I really had to use what I had to hand: white wine (thankfully there’s still some left to drink), a head of garlic, thyme, half an onion, and about four sticks of celery that were languishing in the back of the crisper but surprisingly decent. Roasting most of the garlic first lends the stock extra caramelly sweetness and depth. And I think I like it better with the white wine – the colour is certainly less funky than my first, red-wine version. Preheat oven to 350F (180C). Slice the top off the whole head of garlic, keeping all the cloves together but exposing their flesh. Drizzle a tablespoon of oil over the cloves and roast for 45-60 minutes (until soft and caramelised). When it’s cool enough to handle, squeeze the garlic out of the papery shell and use the back of a spoon to mash it to a paste in a small bowl. Meanwhile, warm 2 Tbs of olive oil in a large, heavy-bottomed pot and cook the onion and celery over medium heat until starting to brown and soften, about 5 minutes. Add chicken for a minute or two. Pour in the wine and add thyme. It will sizzle a bit but give it a couple of minutes to cook off the alcohol and come back to a simmer. Add 10 cups of water, bring to a boil, then cover and simmer on a medium-low heat for 90 minutes. After 90 minutes add mashed roast garlic, salt and pepper. Simmer another half hour. Give the stock some time to cool so any fat starts to set on the surface and you can scrape it off. Strain out the chunks and retain the liquid. If you don’t use the stock immediately, it keeps in the fridge 2-3 days or you can freeze it. What do you do with the 6-7 cups of stock you’re left with? 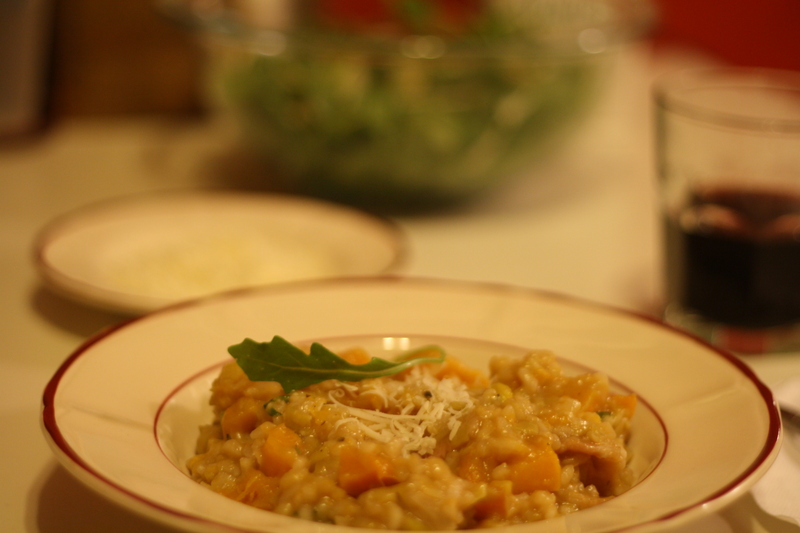 Last time I made a fall-centric butternut squash risotto (pictured at top of post) and a green curry with loads of vegies; this time I made a simple, perfect lemon risotto. Honestly, it’s the most gorgeously textured risotto I’ve ever made. I was worried it wouldn’t work given that the original recipe used a cup of grated parmesan and I didn’t have any, and that I only had one lemon. But I like to think the stock itself gave the risotto so much flavour that the zest and juice was plenty. To compensate for lack of parmesan I served the risotto with a dollop of hurricane pesto and a wee crumble of feta – it was amazing. And a caramelised broccoli I tried was a perfect accompaniment. Warm broth to a simmer in a saucepan, keep warm. Warm olive oil and melt butter in a large, heavy-bottomed pot over medium heat. Saute shallots/onion for 5-6 minutes until tender, add rice and cook, stirring, for 1-2 minutes. Add wine and stir until it evaporates. Add 1 ½ cups of stock and stir until evaporated. Continue adding stock ½ cup at a time until evaporated, stirring regularly, until you have a creamy consistency and rice is tender. Remove from heat and stir in lemon juice and zest, parsley, some cracked pepper, and finely grated parmesan cheese if you have it. I didn’t even need salt. Serve in bowls topped with a little parmesan, or pesto, or fresh arugula, or grilled asparagus… Or serve as a side with some beautifully cooked seafood or steak. Get creative!